With the cold winter weather gripping much of the U.S., it is very important to keep your HVAC system running efficiently to heat your home. The HVAC system distributes the heating and cooling in your home through the air ducts and any issues or loss of efficiency can end up costing you. Debris buildup within the air ducts restricts air flow and causes the system to work harder which will lead to higher heating bills. Professional air duct cleaning services not only remove the built-up debris to help improve the efficiency of the HVAC system, but also help discover any other issues that could lead to lower efficiency or breakdowns. The dust and debris that float in the indoor air gather within the air ducts each time the system turns on. As the debris accumulates, it restricts the airflow which results in poor circulation. Poor circulation causes the HVAC system to work harder to heat or cool your home and this may prevent the system from heating your home efficiently. 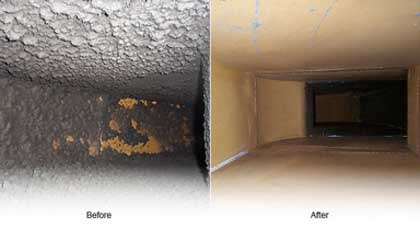 Professional air duct cleaning improves the air circulation within the HVAC system by removing debris from the air ducts and component parts. Better air circulation means more efficient heating which will help keep your home comfortably warm throughout the winter and lower your heating bills. Dirt and debris buildup can put considerable wear and tear on the air ducts and component parts because it causes the system to work harder. This extra stress increases the risk of a breakdown which can leave you without heat in the winter. Having your air ducts cleaned regularly will save you money in the long run by reducing wear and tear that could lead to costly repairs or breakdowns. The air filter helps trap any dust and debris that passes through the HVAC system to protect the internal parts and help improve the indoor air quality. Generally, you should change these filters every 30 days when they become full of debris. If you keep your air ducts consistently clean, you will not have to change your air filter as often. However, you should still check it every 30 days or so to make sure. The air ducts must be sealed properly to prevent air leaks that lower the efficiency of the system. Professionals that provide air duct cleaning services can thoroughly inspect the HVAC system for leaks and improper sealing. Air leaks waste the heat which raises your heating bills and a small leak can grow into a large hole in the duct work over time. Repairing the air leaks will immediately improve the efficiency of your HVAC system and lower your heating bills. In summary, professional air duct cleaning services improve the efficiency of the HVAC system and expose certain issues before they lead to expensive breakdowns. Both benefits will save you money as a more efficient HVAC system results in lower energy bills and catching potential issues early will save you plenty on repairs and maintenance. Talk to a professional near you that provides professional air duct cleaning services about cleaning and inspecting your HVAC system. This simple service could save you from losing your heat in the middle of winter. How to Breathe Cleaner Air During the Winter Months!